I had a delightful interview with Dave Probert at Tangential Deviation. The conceit of the series is that you begin wherever the last interviewee stopped, so we began with light sabers and ping-ponged through a variety of subjects in the very tangential way that comes to me perfectly naturally (attention span of an otter: check!). I know I got Rothko, the Tate Mod, film noir, teaching creative writing and Vic Reeves in there, so the usual sort of madness. Listen if you have the time to be amused. Also just as I was packing away Miss C’s doll herd, I see that the cover is out for the special issue of Clues edited by Fiona Peters. It includes my essay on the French film adaptation of The Talented Mr Ripley, Plein Soleil with a suntanned Alain Delon, ooh la la. Naturally I had to watch it a few times. 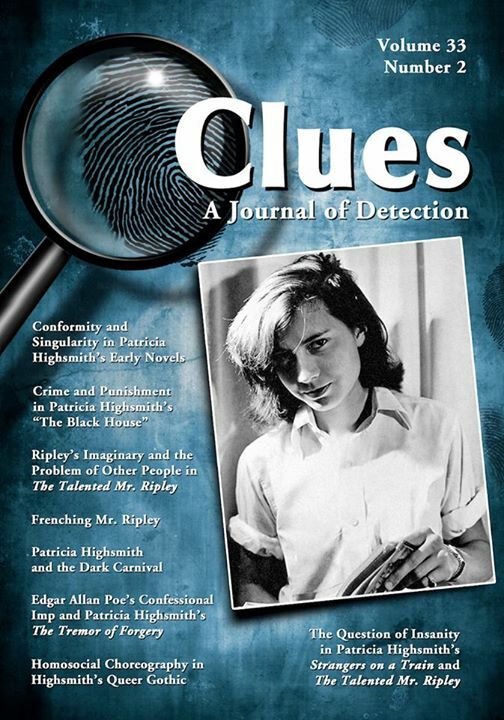 As you can tell, the whole issue is about Patricia Highsmith, so you will want to devour it all. Soon! Sounds like a productive week!